Advanced economies use a lot of aggregate, about 6 to 12 tonnes per person per year. Most aggregate comes from hard rock quarries but some is sourced from river gravels. It is well know that mining gravel from rivers can cause a lot of problems. Moving gravel miners out of the river and onto the floodplain is often seen as a safer option but there are substantial risks. 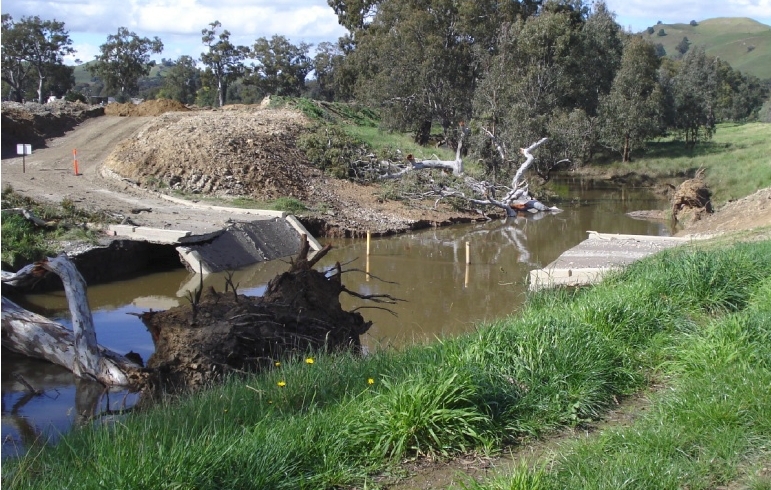 We reviewed local, national and international case studies of floodplain gravel mines and found 37 documented examples where rivers had diverted through mining pits causing erosion and, in some cases, loss of infrastructure such as bridges. The following figures show an example of the types of problems that can occur. In this case a creek broke into a floodplain gravel pit causing the bed to erode. This erosion progressed upstream destroying a crossing on a private quarry access road. Ladson, A. R. and Judd, D. (2014) A review of the effect of floodplain gravel mining on river stability. 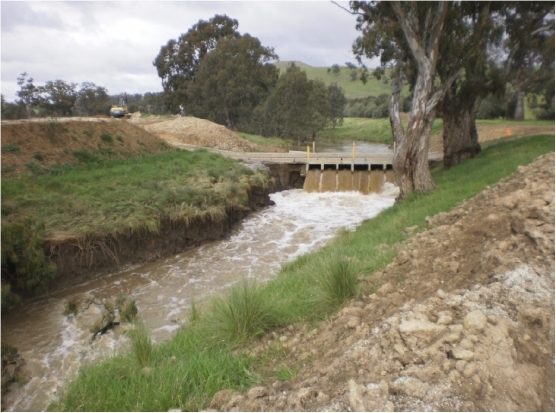 7th Australian Stream management conference. Townsville. River Basin Management Society (paper). A list of the main references we found related to floodplain gravel mining. Bull, W. B. and K. M. Scott (1974) Impact of mining gravel from urban stream beds in the Southwestern United States. Geology 2: 171-174. Collins, B. and T. Dunne (1990) Fluvial geomorphology and river-gravel mining: a guide for planners, case studies included. California Department of Conservation, Division of Mines and Geology. Dunne, T. and Leopold, L.B. (1978) Water in Environmental Planning. W.H. Freeman and Co., San Francisco, CA. Erskine, W. (1990) Environmental impacts of sand and gravel extraction on river systems. The Brisbane River. A source-book for the future. P. Davie, E. Stock and D. Low Choy, The Australian Littoral Society Inc. in association with the Queensland Museum; Brisbane, 295-302. Erskine, W. D. (1996) Sustainable sand and gravel extraction. First National Conference on Stream Management in Australia. Merrijig, Victoria. Cooperative Research Centre for Catchment Hydrology, pp. 69-74. Follman, E.H. (1980) Interdisciplinary overview of gravel removal. In: Woodward-Clyde Consultants, ed. Gravel removal studies in arctic and subarctic floodplain in Alaska – technical report; pp. 331-384. U.S. Fish and Wildlife Service, Biological Services Program, FWS/OBS-80/08. Galay, V. J. (1983) Causes of river bed degradation. Water Resources Research, 19(5): 1057-1090. Harvey, M. D. and T. W. Smith (1998) Gravel mining impacts on the San Benito River, California. International Water Resources Engineering Conference Location. (eds) S. Abt, , J. Young Pezeshk and C. Watson. Memphis, TN, American Society of Civil Engineers: 304-309. Klingeman, P. C. (1998) River restoration and near-channel gravel mining. International Water Resources Engineering Conference Location (eds) S. Abt, , J. YoungPezeshk and C. Watson. Memphis, TN, American Society of Civil Engineers: 672-677. Kondolf, G. M. (1994) Geomorphic and environmental effects of instream gravel mining. Landscape and Urban Planning 28: 225-243. Kondolf, G. M. (1997) Hungry water: effects of dams and gravel mining on river channels. Environmental management 21(4): 553-551. Kondolf, G. M. (1998) Environmental effects of aggregate extraction from river channels and floodplains. In: Aggregate resources: a global perspective. P. O. Boborwsky. Rotterdam, A. A. Balkema: 113-129. Kondolf, G. M. and M. L. Swanson (1993) Channel adjustments to reservoir construction and gravel extraction along Stony Creek, California. Environmental Geology 21: 256-269. Kondolf, G. M., J. C. Vick and M. R. Ramirez (1996) Salmon spawning habitat rehabilitation in the Merced, Tuolumne, and Stanislaus Rivers, California: an evaluation of project planning and performance. , Water Resources Centre Report No. 90. University of California, Berkeley. Kondolf, G. M., Smeltzer, M. and Kimball, L. (2002) Freshwater gravel mining and dredging issues. Center for Environmental Design Research. University of California, Berkeley for the Washington Department of Fish and Wildlife, Washington Department of Ecology and Washington Department of Transportation. Langer, W., H. (1999) Environmental impacts of mining natural aggregate. Proceedings of the 35th Forum on the Geology of Industrial Minerals – The Intermountain West Forum 1999, Salt Lake City, UT, Utah Geological Survey. Mossa, J. and M. McLean (1997) Channel planform and land cover changes on a mined river floodplain – Amite River, Louisiana, USA. Applied Geography 17(1): 43-54. Mossa, J. and S. R. Marks (2011) Pit avulsions and planform change on a mined river floodplain: Tangipahoa River, Louisiana. Physical Geography 32(6): 512-532. Norman, D. K., C. J. Cederholm and W. S. Lingley (1998) Flood Plains, Salmon Habitat, and Sand and Gravel Mining. Washington Geology 26(2/3): 3-28. Scott, K. M. (1973) Scour and fill in Tujunga Wash – a fanhead valley in urban Southern California – 1969. Geological Survey Professional Paper 732-B, United States Geological Survey. Uribelarrea, D., A. Perez-Gonzalez and G. Benito (2003) Channel changes in the Jarama and Tagus rivers (central Spain) over the past 500 years. Quaternary Science Reviews 22: 2209-2221. This entry was posted in Hydrology and tagged Gravel mining, River management on September 3, 2014 by tonyladson. The bridge there is the quarry crossing, installed and owned by the quarry. It is not a road. Thanks Andrew, I’ve edited the post to make it clear that this was a private road.